We injected the drugs 48 h prior the cryoinjury waiting for the depletion of NAD after the NMAPT was inhibited by FK866. To study the effects of FK866 and NMN in the chronic phase after cryoinjury (on day 14 after cryoinjury), we injected both drugs twice to prolong their effects; that is, the drugs were injected 48h before cryoinjury and immediately after cryoinjury. To induce brain cryoinjury, mice were anesthetized by intraperitoneal injection of chloral hydrate (400 mg/kg) and fixed on the stereotactic frame. Rectal temperature was maintained at 36.5–37.5°C with a heating pad. After exposing the skull, a metal probe (weight, 100 g; tip diameter, 3 mm) cooled in liquid nitrogen was applied to the surface of the skull above the right parietal lobe (the center of the probe was located 1.5 mm lateral to the midline and 3.0 mm from bregma) for 30 s. The incision was then sutured and mice were placed in a warmed box to recover from anesthesia. The sham-treated mice were also anesthetized and the skull exposed, but there was no cryoinjury. 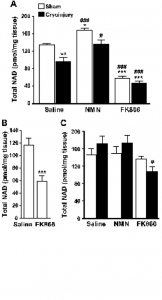 Effects of FK866 and NMN on NAD in the mouse brain cortex. (A) Effects of FK866 and NMN on the NAD level in the mouse brain cortex at 24 h after cryoinjury. N = 8. ⁄P < 0.05, ⁄⁄P < 0.01, ⁄⁄⁄P < 0.001, compared with sham-saline, one-way ANOVA; #P < 0.05, ###P < 0.001, compared with cryoinjury-saline, one-way ANOVA. 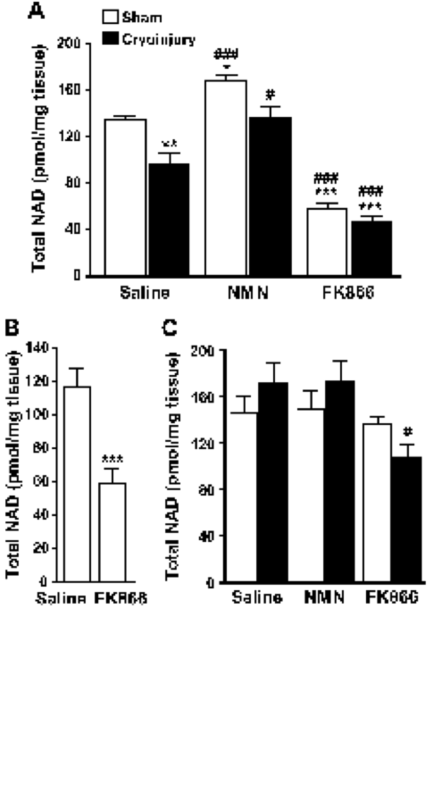 (B) Effect of FK866 on the level of NAD in the mouse brain cortex on day 14 after intracerebroventricular injection. N = 3. ⁄⁄⁄P < 0.001, compared with saline, Student’s unpaired t-test. (C) Effects of FK866 and NMN on the NAD level in the mouse brain cortex on day 14 after cryoinjury. N = 6. #P < 0.05, compared with cryoinjury-saline, one-way ANOVA. For histological examination, mice were perfused transcardially with 4% paraformaldehyde after pre-wash with ice-cold normal saline under deep anesthesia. Brains were removed and fixed in 4% paraformaldehyde overnight and dehydrated in 30% sucrose for 5–7 days. Then 20-lm cryo sections were cut (CM1900, Leica, Germany). To measure the lesion volume and neuron density, the sections were stained with 1% Toluidine Blue. The lesion area was defined as the area with reduced Toluidine Blue staining. The infarct area (mm2) was measured for one slice in every six brain slices; the lesion volume (mm3) was calculated by the sum of lesion area 0.12 mm thickness for six sections. The neuron density (cells/mm2) in the neocortex within the core of the lesion and in the periphery was calculated. To visualize astrocytes and macrophages/microglia in the early phase after cryoinjury, sections were blocked with 10% goat serum. Then, they were sequentially incubated with mouse anti-glial fibrillary acidic protein (GFAP) (1:1000; Millipore) or rabbit anti-ionized calcium- binding adaptor molecule 1 (Iba1) (1:1000; Wako) overnight at 4 °C, then incubated with FITC-labeled goat anti-mouse IgG (1:200; Chemicon) or CY3-labeled goat anti-rabbit IgG (1:200; Chemicon) for 2 h. Finally, the sections were mounted on slides by using an anti-fade medium containing DAPI (Invitrogen), and images were captured under a fluorescence microscope (Olympus 172 BX51, Japan). 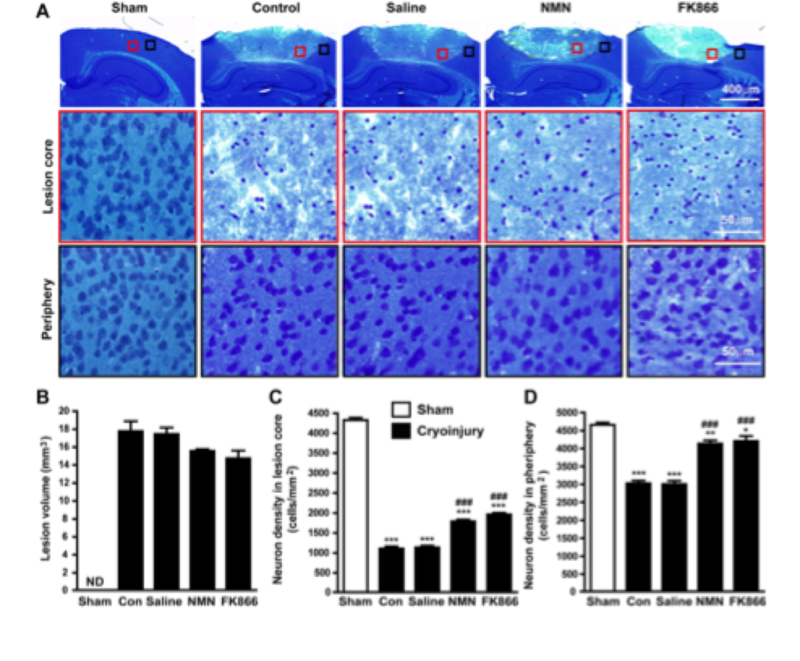 FK866 and NMN attenuate brain injury at 24 h after cryoinjury. (A) Representative sections stained with Toluidine Blue. (B) Statistical analysis of lesion volume. (C, D) Neuronal density in the lesion core (C) and lesion periphery (D). N = 6. ⁄P < 0.05, ⁄⁄⁄P < 0.001, compared with sham, one-way ANOVA; ###P < 0.001, compared with cryoinjury-control (Con), one-way ANOVA. ND, not detected. To determine the distribution of NAMPT expression, sections were incubated overnight with rabbit anti- NAMPT (1:400; Bethyl) plus rat anti-mouse NeuN (1:1000; Millipore), or plus mouse anti-GFAP (1:1000; 177 Millipore), or plus mouse anti-Iba1 (1:250; Millipore). Then, these sections were incubated with FITC-labeled goat anti-mouse IgG (1:200; Chemicon) plus CY3- labeled goat anti-rabbit IgG (1:200; Chemicon) for 2 h. Finally, the sections were mounted on slides by using an anti-fade medium containing DAPI (Invitrogen), and images were captured under a fluorescence microscope (Olympus BX51, Japan). To measure the density of astrocytes and macrophages/microglia in the chronic phase after cryoinjury, sections were sequentially incubated with rabbit anti-GFAP antibody or rabbit anti-Iba1 antibody overnight at 4 °C, then incubated with biotinylated goat anti-rabbit IgG (1:200; Zhongshan Biotechnology Co., Beijing, China) for 2h and horseradish peroxidase streptavidin (1:200; Zhongshan Biotechnology Co., Beijing, China) for 2h, and finally visualized using diaminobenzidine (DAB kit, Zhongshan Biotechnology Co.). A light microscope (Olympus BX51, Japan) was used for image capture. The density of GFAP-positive cells in the lesion border and Iba1-positive cells in the lesion core was calculated. The optical density in the border or center of the lesion was measured. 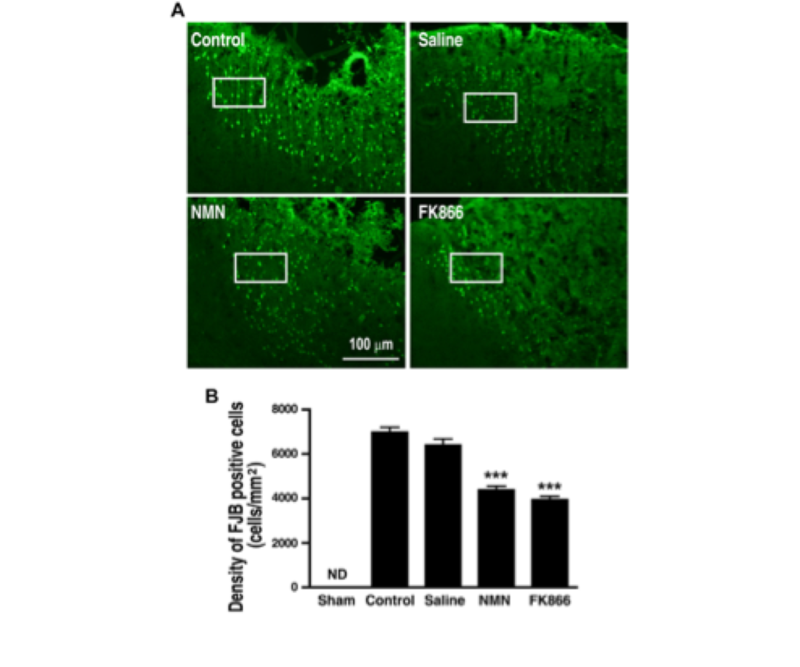 FK866 and NMN attenuate neuronal degeneration in the mouse brain cortex at 24 h after cryoinjury. (A) Representative sections stained with Fluoro-Jade B. (B) Statistical analysis of the density of degenerating neurons in the lesion core. N = 6. ⁄⁄P < 0.01, compared with control, one- way ANOVA. ND, not detected.